Solar Water Heat is a highly popular Green Energy alternative to electric water heaters. Solar water heat is nothing new, water has always been heated using the suns rays. Ask any pool owner and they are well aware of the power of solar heat. Modern science has taken a large leap forward in harnessing the suns heat capacity. Today we can find inexpensive solar water systems that are capturing over 90% of the suns energy. Compare that to solar voltaic cells which are around 15% efficient and you can quickly see why there is so much talk regarding solar water heating. From heating pools, hot tubs, houses, and even commercial,shops, all can be done efficiently using solar. Electric or gas may still be used as a back up but the primary heat source can be solar. The image below is a shop in Northern Canada heated entirely using solar water heaters. People often associate outside temperature with solar energy. However this is a completely incorrect perception. In fact the winter month often provide more clear sky days to harness sunlight than do the summer.With the introduction of pure vacuum tube technology, we are finding means of harnessing nearly all the suns radiant energy. 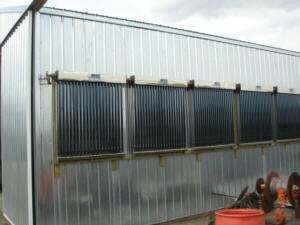 Collectors are the key component of Massloads Solar Water Heater. Each of them is configured by two concentric glass tubes. The inner glass tube is coated with the latest world magnetron sputtering Hi-Techs, layers of aluminum-nitrogen with aluminum base, which absorbs and converts the maximum amount (>0.92,80oc) of solar radiation including infra red light into heat, whilst having very small radiation losses(<0.09,80oc). The jacket between outer and inner glass tubes is evacuated and permanently sealed off to form the best possible insulation, which allows sunlight penetrate perfectly while preventing heat loss. 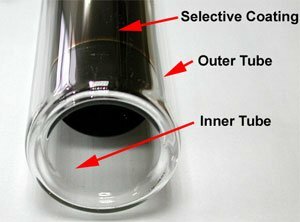 In order to maintain the vacuum between the two glass layers, a barium getter (gas absorbent) is used inside the top end of the outer tube. What this means in is that once the solar radiation is converted into heat, it is completely sealed by a protective vacuum insulator. The heat will not dissipate even in minus 40 degree weather. The circular design means the sun will always be hitting the solar tubes perpendicularly for max heat absorption through the entire day. 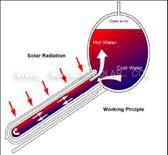 The water or liquid medium inside the tube is heated and a simple principle of thermosiphon causes the hot water to rise up wards and colder water falls to bottom of tubes. The hot water is stored in a highly insulated double walled manifold. a light circulating pump either electric or solar is used to circulate the water through the manifold quickly raising the temperature. This short video shows the power of only one solar collector. Out side temperature is 58 Degree Fahrenheit in Manitoba on a September 40% partly cloudy day.